Every sailor has heard of the infamous St. Maarten Heineken Regatta, held every March in St. Maarten, FWI. Crystal clear waters, a truly international sailor base with over 2,500 participants, and the world’s elite of sailing yachts. What more can a crew eager to go racing ask for? 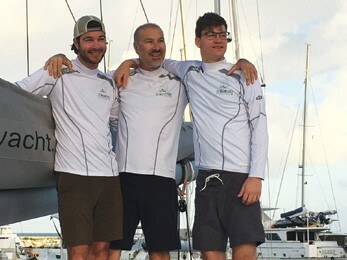 The Tarjan family (Flo, Victor, Philippe and Gregor) entered their German/French-built Bavaria-Nautitech 40 Open catamaran FLO 2 in the Offshore Multihull division in this year’s Heineken Regatta. Gregor, the CEO and Founder of the well-known New York-based multihull dealership Aeroyacht Ltd, was at the helm. Winds were forecast to be fresh easterlies with 25-knot trade winds blowing constantly with very little deviation. Deciding to carry full sail, the Tarjans pushed their fast cruising catamaran hard. Despite messing up both starts, they claimed line honors in the first race. “The second day of the regatta was mayhem, with dozens of broken masts and booms and an unfortunate sailor even losing one of his fingers,” Gregor reported. FLO 2 remained strong, finishing third on corrected time on the second day. “The Heineken Regatta is the largest warm water regatta in the world and should be on the bucket list for every sailor,” Gregor enthused. The 38th St. Maarten Heineken Regatta is scheduled for March 1- 4, 2018. Visit heinekenregatta.com for more information. To learn more about multihulls available at Aeroyacht Ltd including Bavaria-Nautitech, Sunreef Yachts, Outremer Catamarans and various power cats as well as charter ownership opportunities, log onto aeroyacht.com.